On the banks of the Yellow River, Wei Xinpeng draws on a cigarette as he casts his eye over the murky waters. The 55-year-old is a boatman here. But he plies a gruesome trade. For Mr Wei does not look for fish in these waters. Instead, he pulls human bodies out the river, which he then sells back to grieving families. "I bring dignity to the dead," says Mr Wei. For the families of the missing, the boatman has become the call of last resort. Every day, Mr Wei rows out to a temporary footbridge on the river. It is at this point the bodies can go no further. Since starting his business seven years ago, Mr Wei says he has collected about 500 bodies. Some of them have been murdered, while others have drowned or committed suicide. He says that his last grim catch was just six days ago. "I feel that these people have passed away in a very cruel way," he says. After the boatman collects the bodies he puts them in a small cove where they are sheltered from the currents. When I visit, there are four clay-like bodies lying face down in the water. Mr Wei then places advertisements in local newspapers describing the bodies. Families of the missing phone him and some travel to his village in order to inspect the bodies. Mr Wei takes them out on his boat to the cove and flips over the corpses. He charges them a small fee to look at their faces. And then up to $500 if they want to take the body home. He says that he has sold about 40 corpses. Generally, he says, the families are not angry when he asks for money. But when he found the body of a Communist official the authorities wanted it returned for free. That caused an argument, he says. Sometime people's emotions are strained when they see the corpses. "One time parents came looking for their son," he says. "They saw his body and then walked away without saying a word. They didn't take his corpse." Mr Wei defends what he does. He says the authorities would let the bodies rot in the river. Sometimes he fishes corpses out of the river and gives them a proper burial. But it is not just about the money. The boatman says it is also personal. "My own child died in this river and I could not find the body," he says. "It was very painful. That's why I started doing this job." Eighty kilometres upstream, the city of Lanzhou is the main source of Mr Wei's trade. Once a poverty-stricken provincial capital, it is now a major industrial city. Peng Shujia, 52, visited Mr Wei after his wife, Han Yuxia, went missing this summer. He says that she went to get a bus to visit a relative but never arrived. Mr Peng spends his days putting up missing posters around the city, desperate for any news on his wife. The factory worker has contacted the police and put advertisements in local newspapers. But there has been no word and Mr Wei did not have his wife's body. "It was a form of help," he says, referring to Mr Wei's service. "But it's hard to find anyone missing here. It is just so chaotic. It is almost impossible to track anyone down." Back at Mr Wei's hut, he is packing up for the day. 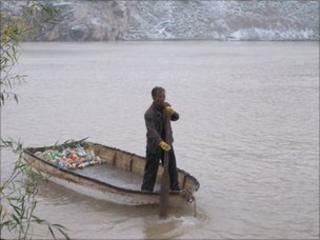 The boatman has lived through a time of remarkable change in China. But every day out on the waters on the Yellow River he sees the dark side to development here - where in the clamour for economic growth some are simply swept away.